uuid : e2e93829-5dbf-4e8e-88d7-cc46da91f0af templates_id: 119485 templates_uuid: "61f9bee3-8da2-47ce-9d9c-41fc690dc3de" title: "LOA Sample - Non-Executive Director Letter of Appointment Template" display_name: "Non-executive director letter of appointment" meta_keywords: "Directors agreement, LOA and Non executive director letter of appointment" description: "
This document is GDPR compliant. Set out the terms of appointment for a non-executive director with this letter of appointment. This straightforward LOA is a great way to layout clear directorship terms, laying the foundation for a mutually rewarding relationship between company and director. Good letters of appointment cover key areas such as director\'s duties, payment of fees, tax, insurance and indemnity arrangements. only for directors of UK companies. What\302\222s a non-executive director letter of appointment? A non-executive director letter of appointment is a formal letter appointing someone as non-executive director of a company. It sets out the main terms of the appointment and the non-executive director\'s responsibilities and duties within the Board of the company. Why do I need a letter of appointment for a non-executive director? A letter of appointment sets out clearly what the directorship terms are, and frames the relationship between the director and the company. It ensures the non-executive director operates in the business\' best interests during the whole course of his office. What\302\222s the nature of the agreement between the company and the appointed non-executive director? This letter is a contract for services and not a contract of employment. Therefore, it should not be used to appoint an executive director, who should enter into a senior employment contract with the company. What\302\222s the role of a non-executive director? A non-executive director should have the same legal responsibilities as any other director. However, the distinction between an executive and a non-executive director lies in the role that they perform. Non-executive directors do not engage in the day-to-day running of the business, but rather assist the executive directors in their strategic decision-making process. Which benefits is the non-executive director entitled to? It is good practice to offer indemnity or insurance protection against liabilities associated with a non-executive director\'s office. For example, the company can decide to pay back to the non-executive director all reasonable costs for independent professional advice, where necessary. This letter of appointment is governed by the law of England and Wales. This letter of appointment must be executed as a deed as it contains a power of attorney from the director, enabling the company to remove him or her from office at the end of the appointment.
" created_timestamp: "2018-10-08 04:36:20.0" modified_timestamp: "2018-10-08 04:36:20.0" active: true created_by: 236 modified_by: 236 dcm_id: 262 url_slug: "Non-executive-director-letter-of-appointment" meta_description: "Create an LOA for a non executive director with step-by-step guidance from Rocket Lawyer. Set out and agree the non-executive director\'s terms of appointment. Try this LOA for free." time_to_complete: "20 minutes" role1: "Employer" role2: "Employee"
Set out the terms of appointment for a non-executive director with this letter of appointment. This straightforward LOA is a great way to layout clear directorship terms, laying the foundation for a mutually rewarding relationship between company and director. Good letters of appointment cover key areas such as director's duties, payment of fees, tax, insurance and indemnity arrangements. Whats a non-executive director letter of appointment? A non-executive director letter of appointment is a formal letter appointing someone as non-executive director of a company. It sets out the main terms of the appointment and the non-executive director's responsibilities and duties within the Board of the company. A letter of appointment sets out clearly what the directorship terms are, and frames the relationship between the director and the company. It ensures the non-executive director operates in the business' best interests during the whole course of his office. Whats the nature of the agreement between the company and the appointed non-executive director? Whats the role of a non-executive director? It is good practice to offer indemnity or insurance protection against liabilities associated with a non-executive director's office. For example, the company can decide to pay back to the non-executive director all reasonable costs for independent professional advice, where necessary. More than just a Non-executive director letter of appointment template, our step-by-step interview and guidance makes it easy to create your document. Easily create online, download, print and sign your free Non-executive director letter of appointment in minutes. 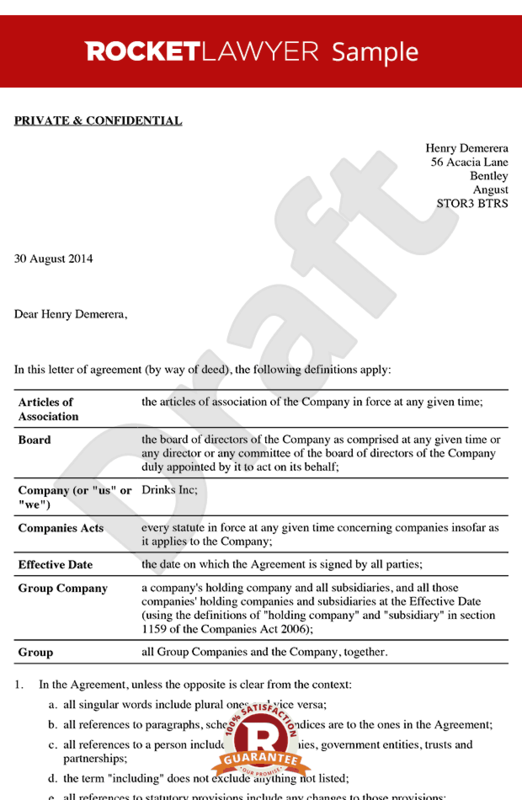 This document is also sometimes called: Directors agreement, LOA and Non executive director letter of appointment.